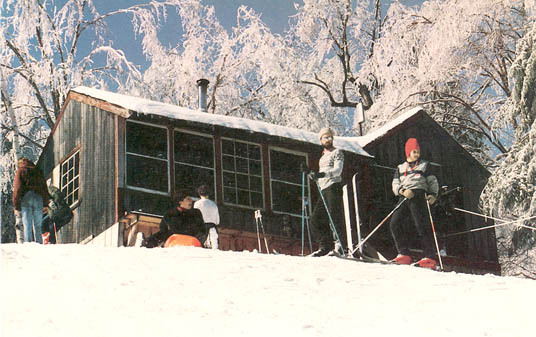 The Dublin School is a private school in New Hamsphire that operated a ski area, primarily for students, from the 1940's through at least 1983. Originally we knew very little of this area, except for one postcard and a listing in a guidebook. But then we heard from 3 alumnae. And then we heard from Cornelia Throssel, whose father actually founded the school! Cornelia donated a book on the history of the Dublin School entitled "Dublin School - 1935 to 1970" by her father Paul Lehmann. This book is invaluable and made for a great read. This book also had many tidbits about the area, and several pictures of the ski area, all of which appear below. Thanks Cornelia! 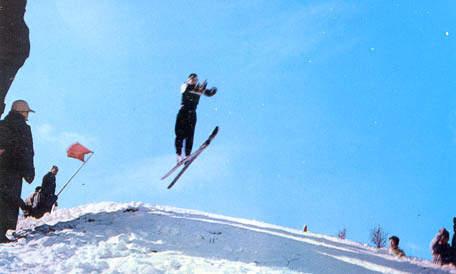 Bill Brown: As I grew up, skiing became more and more important to me. So I selected the prep school I wanted to attend on this basis. 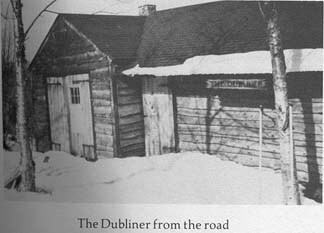 I attended Dublin School in Dublin, NH from 1953 to 1957. Our ski area was said to be the best in the northeast private school system. The post card you show on your web site is a drawing of the lodge at the head of the "South Slope". 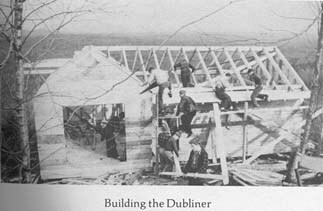 This bulding still exists and can be seen on the downhill side of the Old Harrisville Road in Dublin about a 1/2 mile from Rte. 101 and just past the school itself. This building also housed the engine that ran the rope tow for the south slope and the north slope which was situated just to the right of the bulding as pictured. 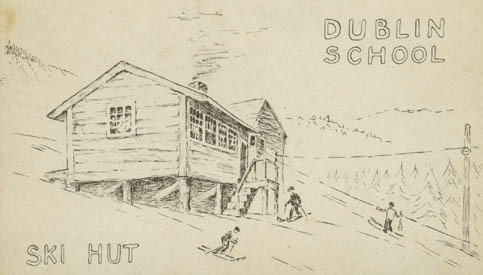 The Dublin School only had about 65 boarding students at the time, and the students did about everything. We had to brush out the trails in the fall as well as clearing any new trails. While I was a student there, we created an entirely new area across the road from the area previously mentioned. 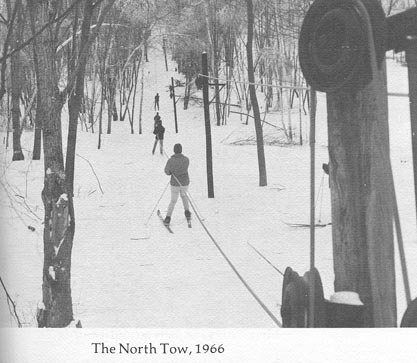 The new area had a new and faster and longer rope tow which I remember was a terror. It was quite steep and somewhat rough, and with the speed of the thing you were often yanked off the ground over the bumps. This new tow took us almost to the top of Beech Hill and from there we cleared a double glade back down to the road as well as a long winding trail called the "Snail Trail". This new tow also gave us access to the top of our racing trail which was called the "Nose Dive" after the famous trail at Stowe. This trail, which we used to have to hike up to get to the top before the new tow, plunged down the steepest part of Beech Hill with some sharp turns and chutes that were, at places, only a few feet wide and then we would have to shoot across the road and be airborne before ending the race at the bottom of the North Slope. This trail was quite well known in it's day and Dublin School would host down-hill, cross-country and jumping compitions with most of the major private schools in the area as well as Putney, Holderness, Mt. Hermon, Andover, Exeter, St. Pauls and the Harvard freshmen and others. Remains of this ski area still exist though grown up. I stopped and looked at it last year with tears in my eyes...so many memories...! When I got there in 1953 there was only the area on the down-hill side of the road served by the one tow which was between the big main slope (south slope) and a smaller slope which was more like a trail called the north slope. I'm looking at an aerial photo of this in the back of the most recent alumni directory ( photo circa 1945) and it shows a lower tow at the bottom of the point where the north and south slopes come together. I don't have a personal memory of the lower tow, so it's possible it had been abandoned by 1953 but don't take my word for it. This whole area was called the "Dubliner" and later when the new tow was put in across the road, it was called the north tow, (confusing). The new north tow was further along the road from the original south slope area by about 1/4 mile, as I remember, but when you took it to the top it accessed the beginning of the "Nose Dive" which angled down the hill and crossed the road onto the old north slope. So it all operated as the same area but there was somewhat of a physical separation. Just thought I would let you know that in 1983 the Dublin school slopes were still in use. 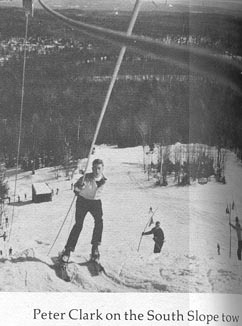 I remember packing them down was a Saturday work detail as well as maintaining the x-county course that let you ski into town. I'm from Berlin/Germany and we have a lost ski area here that really fascinates me and they are thinking of reopening. I spent a year at Dublin School, NH. The school obviously has tons of pictures that could be put on this site. I have seen the area myself. It consisted of North Slope and South Slope, The first simply being above the second, divided by New Harrisville Road, which was simply skied across. Both had a tow and a couple of slopes. There is not much left of North slope - it was abandoned first. South slope doesn't look too bad. 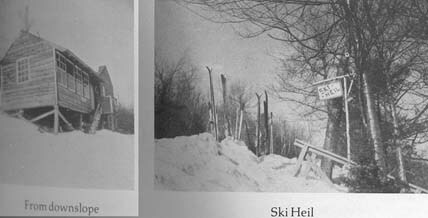 Right on New Harrisville Road there is the ski hut left (you can see it on the postcard), it included the tow engine. There are also some remnants of the poles and of course a wide open slope, that is overgrown with trees and debris. It was used by Dublin School's Ski Team for training and races, definitely longer than 1945. 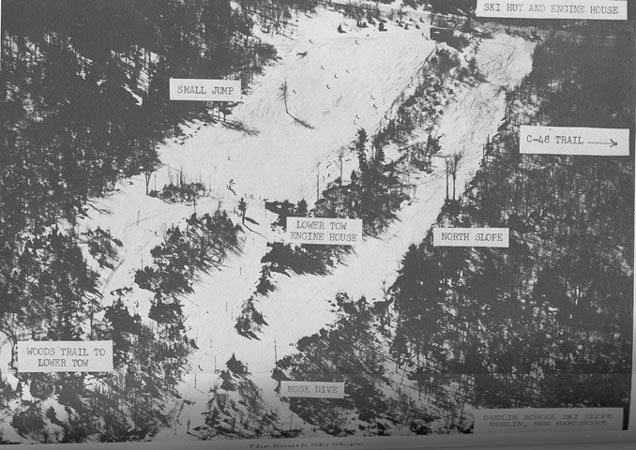 Here is a photo of the North Slope, sent on May 29, 1945 from Dublin, NH. Dear Flirst and Ed: Hope you both are well. Have nice place here. We are across from Dublin and Brick School about 12 mins ride from Peterborough Centre. If you have enough gas, take a ride out. Chet is better. Ethan called me last month. Esther. An interesting comment about gas as it was being rationed during the last part of the War. The following are pictures from Cornelia's father's book on the Dublin School. Compare these pictures with the descriptions of the area from the above alumnae. Most pictures have their own descriptions. The trail map really helps to best describe this area. The "take-off" provides a thrilling and beautiful moment on this new 20 meter jump at the Dublin School, Dublin, NH. Hundreds of acres are devoted to the sport providing cross-country, down-mountain, and twin slalom racing trails as well as an open slope serviced by a rope tow. Dublin School, South Slope. Located in rural southern NH, Dublin School has about 95 students in grades 9 through 12. The South Slope was cleared and is maintained by students and faculty of the coed school, founded in 1935. Dubliner Tow, 1250' long, with 20 acre open slope, trail, jump, on Harrisville Road, 1/2 mile from Dublin Village. 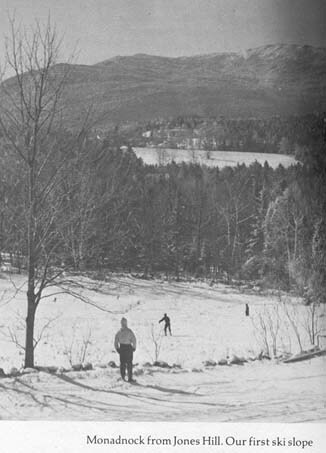 One of the sportiest layouts in the Monadnock Region of SW NH, just north of the Massachusetts border and only 60 to 80 miles from Boston, is the Dublin School tow slope. Located on the east side of Beech Hill at an altitude of 1600 feet, the terrain runs up to 30 degrees in pitch. The Dubliner tow is a connecting one of 1250' and serves 20 acres of open slopes for all classes.